And that’s exactly how I acquired Pure Juliet by Stella Gibbons. I went to a bookshop and, as usual, looked for the recommendation shelves and ‘Costa Book Award Winner’ stickers or similar sorts. But, like always, uninspiring cover designs and cheesy synopsis made me go ‘Meh’. However, after a couple of hours of unsuccessful and tiring search, the white and navy blue, simple yet pretty design (by Chris Silas Neal) caught my eyes. Ashamed to admit that I had never heard of both the title and the author at the time. (Later I found Gibbons’ Cold Comfort Farm was one of those ‘must read’ books of all time.) The book didn’t have those stickers but there was something about the cover – white silhouette of a girl’s profile with seemingly unrelated items (birds, allows, flours, stars and pound coin) around it. I picked it up and instantly I liked the touch of matt textured paper. Then I turned it around to see the back. The back design was a mirror image of the front but with mathematical shapes and symbols instead of birds and stars. I didn’t know what all this meant but I was intrigued. I was sold. I took the book to the till. And I was glad to find out the story was as good as its cover. It’s beautifully and skilfully written. As I read on, I could easily imagine those characters and situations in my head and it was so stimulating! It was the same buzz I’d got when I illustrated War Horse for Folio Society competition. I really enjoyed illustrating the book, so I decided to illustrate Pure Juliet too for my pleasure. Pure Juliet is a story about a teenager called Juliet. (Don’t worry, no spoiler here – so read on.) She doesn’t care about what teenage girls care (clothes, friends, boys etc). She spends hours in her room with incomprehensible mathematical textbooks alone. Masterful Gibbons’ writing takes you right into each character’s head and heart and make you feel their joy, frustration, excitement and other feelings that are hard to describe (but not for Gibbons). 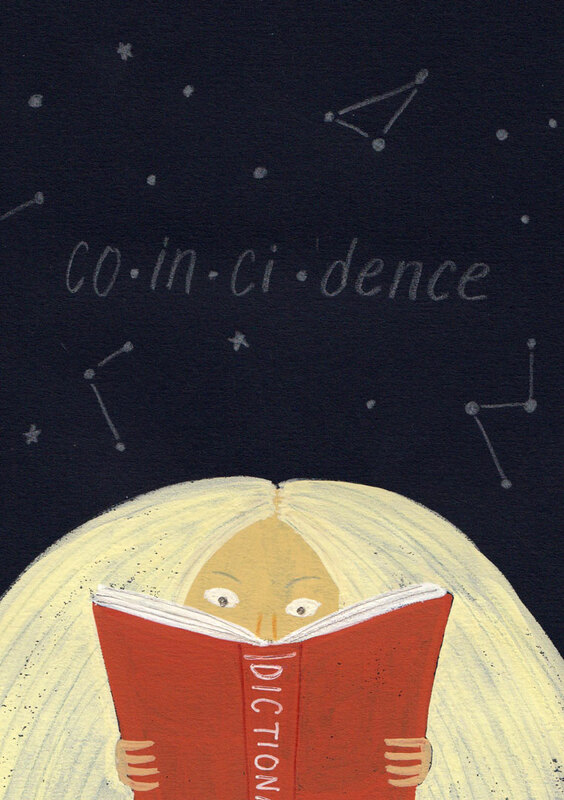 The moment Juliet discovers the definitions of ‘coincidence’ is one of my favourite parts in the book. But the best thing about this story is that it’s unpredictable. The synopsis won’t tell you much so you don’t know what to expect, you can’t tell how it goes and what happens next. Juliet is no average girl in many ways and her journey is full of equally interesting characters and there are brutally dark moments as well as beautifully tender moments. I’m so glad that I found this book and I really enjoyed illustrating it. Cold Comfort Farm is now definitely on my book wish list.